All for just $100 for the first 4 weeks! 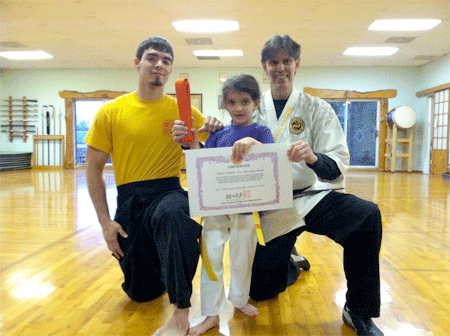 ..our award-winning Children’s Karate programs will help your child achieve their full potential in school & in life! NO MATTER WHAT AGE, WE WILL “BULLY-PROOF” YOUR CHILD! From elementary school to high school, we will give your child the tools & techniques they need to overcome any bully! They will develop the confidence to stand up for themselves… even when confronted by more than one bully! 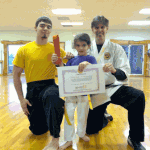 SELF-DEFENSE TECHNIQUES OF CONTROL AND SUBMISSION ARE TAUGHT IN SAFE AND SUPERVISED CLASSES, BY KYOSHI GERRY & HIS CERTIFIED ASSISTANTS! 1. Boost Confidence: Bullies are less likely to target self-confident children. We instill confidence by teaching techniques that will neutralize the attack of a larger opponent. 2. 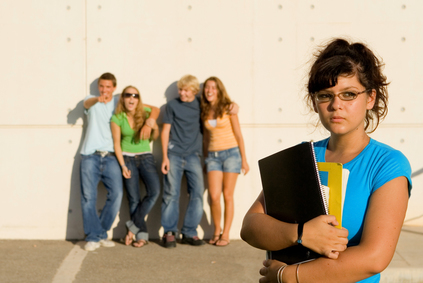 Increase Awareness: Harassment from bullies can be physical or verbal and delivered at various intensity levels. In each lesson, we focus on teaching your child to recognize and respond to the most common physical and verbal bully behaviors. 3. Be Ready: Only when your child makes it clear that he/she will not tolerate the harassment, will they free themselves of the bully’s torment. We will prepare them for every common contingency. The other objective of the Bully-Proof program is to instill in your child the character traits that will lead to success in all areas of life. Our “Dojo Word of the Month” Character Development Program will cover such topics as Responsibility, Respect, Citizenship, Manners, and Caring. The Children will receive a Newsletter every month with the Dojo Word of the Month incorporated into an article; then at the end of the month, they will do an assignment to bring in to the dojo to receive a belt tip which signifies that they are one step closer to BLACK BELT! To become stronger means a strong body, strong mind & strong spirit. A strong body gives them confidence to handle physical confrontations. A strong mind gives them the confidence to say “No” to unhealthy peer pressure, so they become a leader, not a follower. A strong spirit means “NEVER GIVE UP” – No matter how hard or difficult. Becoming smarter by doing their school work with “Black Belt Focus” means that they learn how to develop good study habits. Controlling their emotions so they don’t become upset, angry, afraid, wild, aggressive or dis-respectful will help them stay out of trouble. We teach the children that defending themselves does not mean having to ‘fight’, but rather, how to assert themselves so they do not become victims of bullying; and if physically confronted, how to use their Karate skills to end the confrontation as quickly and non-aggressively as possible. To stay healthy, we all know that we should eat and drink the right foods and beverages. We teach the children how to make the smart choices when it comes to their meals and snacks. We also teach them to ‘finish their work first’ whether it is their school work, chores around the house, or any other task that needs to be completed; before they think about play time. This helps develop the self-discipline needed to succeed in school and beyond.